When you are working a puzzle, such as a crossword puzzle, and you come to the end of what you can do on your own, do you consider it cheating to look at the solution for hints so you can finish the puzzle? Do you see checking the answer as part of the fun of doing puzzles? Or do you abandon the puzzle half-finished to keep from cheating? If you do consider it cheating to check the solution for an answer you have no way of figuring, do you also consider it cheating to ask someone, to use a crossword puzzle dictionary, or to look online for the answer to the clue? Do you find yourself shying away from more difficult puzzles because you can’t do them without cheating? This has nothing to do with anything, of course, I’m just curious what you think. I did a hard Sudoku this morning and had to check the solution to keep going. I used to consider it cheating to check the solution when I got stuck, but after realizing how many puzzles I wasted by not jump starting the puzzle, I understood it was simply a way of working the puzzle and had wasn’t dishonest. 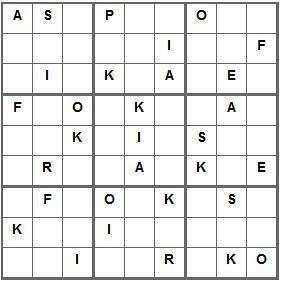 Just for fun, here are a couple of A Spark of Heavenly Fire Sudoku. You work these exactly as you do number Sudoku, but you use the letters from A Spark of Fire. (A, S, P, R, K, O, F, I, E). If you don’t know how to do Sudoku, you can find the directions here: http://www.sudoku.ws/rules.htm You should be able to print out the puzzles to make them easier to work. I suppose that the response to this relates to your understanding of the word, “cheat.” I really think that cheating implies an intent to deceive in order to gain some advantage. When the issue is the solution to a puzzle, like Sudoku, there is no intent to deceive someone as you are the only participant. Solving the puzzle is a worthwhile achievement, and if it requires some sort of research or extra effort in order to arrive, finally, at the solution, then you harm no one by making that effort. You are not deceived, and you have not gained unfair advantage over anyone, so no… I’d say it is not cheating. Sue, yes! Very good points. Once I started checking the solution to jump start a puzzle when I got stuck, I found I that I learned more about how to solve the puzzles, and so could progress to more difficult puzzles than if I had just given up. Better for the brain that way. If I peeked at the answer, I wouldn’t feel like a cheat, but I wouldn’t feel like I really solved the puzzle either. Puzzles that require trial and error or peeking to be solved annoy me. The puzzles I make for my blog can be solved using logic. I wait a week before I publish the answers so readers will be less tempted to guess and check or peek at the solution. My level 6 puzzles can be really hard so I’m sure a lot of peeking would go on if I didn’t wait to publish the answers. Some of the difficult sudoku require more trial and error than logic, and that annoys me and takes the fun out of doing the puzzle. The way I figure, checking the solution to fill in a couple of extra squares just takes the puzzle down a notch, from difficult to medium, and makes it fun again. As far as I’m concerned, trying to find the answers in various resources is just doing research, and I’ve always been a fan of research. I like to use the opportunity to learn. I was referring specifically to Sudoku, the puzzle in the post title. When I do the toughest puzzles that my newspaper offers, sometimes I get stuck, and I have taken a peek at the answer. When the puzzle is finished, I don’t feel like I really solved it. On the other hand, I have only completed ONE newspaper crossword puzzle in my life. It would not have gotten finished without help from the internet, and I suppose I did learn something about the world while I went through the process. Still completing that one puzzle did not make me any better knowing what to write in the little crossword squares. Cheating at Solitaire is a no-no. But a crossword? After admitting to yourself that you’re stumped, looking at the answer is educational in my opinion. Same with Bridge or Chess puzzles. If I screw up a Sudoku, I either try to correct it or admit that I blew it. I see no point in looking at the solution. When I first started doing Sudoku, if I goofed, I would redraw it and start over.